American parents spend four billion dollars a year on tutoring millions of children, and this figure is expected to grow by more than twelve percent annually. Why not make the most of this trend? Whether you are an educator or otherwise have expertise in a particular field, How to Start a Home-Based Tutoring Business gives you all the tools and success strategies you need to launch and grow your business. A longtime teacher and tutor shares her experiences and advice on every aspect of the field. 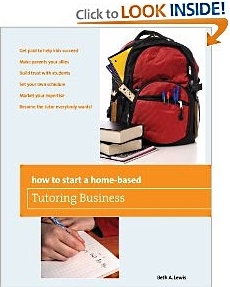 So You Want to Start a Home-Based Tutoring Business? How Will You Define Business Success? Beth A. Lewis covers everything from writing a business plan, setting your rate, organizing your workspace, and marketing, to keeping clients happy and monitoring student progress to show results. She also provides indispensable guidance on legal and ethical issues, on cutting costs for textbooks, and on becoming and staying profitable, as well as how to use the Internet to develop your business. Click here for more information.